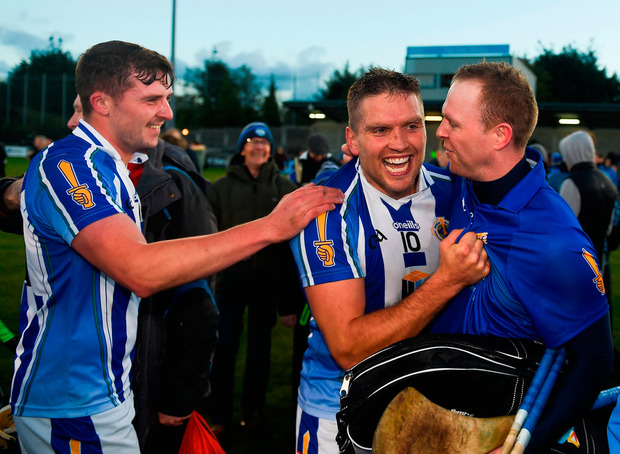 IF there was a single player symbolic of Ballyboden St Enda's seventh county title, won at the expense of Kilmacud Crokes in Parnell Park today in their replayed final, it was Conal Keaney. At 36, but clearly ageless in sporting years, Keaney was the game's prevailing force in a team that hadn't so much as contested a county final in five years and were, therefore, considered to be over the championship-winning hill. "An incredible warrior," was how Boden's manager, Joe Fortune described Keaney afterwards and, as the last of the natural light faded in Donnycarney, it would have been difficult to argue with him. Keaney scored 0-4, all from play, but his influence on the game was much more profound than any single statistic could illustrate. Simon Lambert, Shane Durkin and Paul Ryan – all survivors of Boden's six titles in seven years between 2007 and '13 – also thrived in another county title win, aided and abetted by some of the club's newer talent, hurlers with big futures like Aidan Mellett and Luke Corcoran. For Crokes, their third county final defeat in consecutive years came festooned with many little disappointments and one big one. By the middle part of the second-half, the period during which Boden confirmed their dominance, two of Anthony Daly's most trusted troops from his time with Dublin, Niall Corcoran and Ryan O'Dwyer, were gone with injuries. Before that, in the 21st minute, we had the game's most contentious moment. Marc Howard, the former Cork U-21 player who had been so important to Crokes all year, tore through the Boden defence and drew Gary Maguire from his goals. Just as he attempted to flick a goal, he was scythed down from the side. Referee Jason Ó Buachalla awarded the obvious penalty and issued a yellow card to Shane Durkin for his role in the foul. "I was incensed because I was sorry for Marc, I have to say because he was Trojan for us since he joined," Daly reflected afterwards. Howard, Crokes' penalty-taker, was taken off with what Daly speculated afterwards could be an ACL injury. Oisín O'Rorke's penalty was saved by Maguire and Boden got out of a potentially wounding situation without so much as a scratch. To O'Rorke's eternal credit, however, he hit the next 1-3 for Crokes. His goal put Crokes two points up, a lead they took into half-time but couldn't preserve as their defensive pillars crumbled. Still, Ballyboden were a point down in the 39th minute when Paul Ryan stood over a close-range free. "It was dipping, a low shot to the corner, he's a brilliant striker of the ball," said Daly. From there, Boden's tight, physical defence kept Crokes to just five points – four frees – while three from Fortune's bench and Ryan's sweet striking from placed balls saw them home. "We're not done yet," Fortune said, drawing immediate attention to next Sunday's Leinster quarter-final against Clonkill in Parnell Park.